1.First Download MyGenie app from Playstore. 4.You will receive 4 digits pin,Verify mobile number with this pin. 5.There are many offers available under offers section,Download one by one all apps and get Free Mobile Recharge Credits. 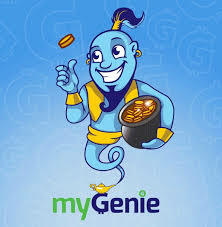 6.Earn More Credits By Referring friends,for this Under Refer tab copy and share your unique refer link with your friends,When your friend will install MyGenie app through your referral link and register in app then you will get Rs 5. 7.Collect Minimum 20 Credits for Redemption.For Redeem Credits Go to Recharge Section and Enter your mobile number,operator and amount.Also You can recharge other mobile numbers. Unlimited Trick : This app has no auto mobile verification So we can refer with Bluestacks or Youwave. Hope,All of you know what to do for Unlimited times referring. Open Bluestacks,Put your Referral Link,Install MyGenie and Register in App.You will get Rs 5 in your main account.After 1 refer open Bstweaker and change Guid,Andoid Id,Google Advertisement id of Bluestacks and Click on Restart .Now again Refer with new number.Do it for Unlimited times to get Unlimited Credits.